Mandan Police Chief Jason Ziegler announces an arrest in a quadruple homicide during Thursday night press conference in Mandan. Ziegler said Chad Isaak, 44, of Washburn, was arrested for the four murders in Mandan. Isaak is in the McLean County Jail in Washburn. In back, from left, are Lori Flaten, deputy police chief, and Mandan Mayor Tim Helbling. Authorities arrested a Washburn chiropractor Thursday in connection with the killings of four people found dead Monday at a Mandan business. Police identified a suspect vehicle through surveillance video, leading to a traffic stop in Washburn where McLean County deputies and the North Dakota Bureau of Criminal Investigation detained Isaak. Ziegler said evidence in the vehicle and on Isaak provided probable cause for Isaak’s arrest. He was arrested at 7:46 p.m. Ziegler said police are not looking for other suspects. 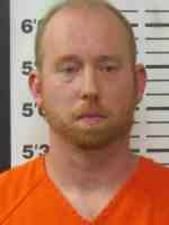 Isaak was being held at the McLean County Jail in Washburn. It was unclear when formal charges would be filed or when Isaak would make a court appearance. The chief said a motive for the killings is unknown. He would not comment on whether investigators had recovered a weapon or weapons. Ziegler also said he could not offer a time frame for the homicides and emphasized the investigation is still active. Ziegler said police had not received a report from the State Medical Examiner’s Office. Police discovered the bodies after receiving a 911 call for a medical assist about 7:30 a.m. Monday to the business at 1106 32nd Ave. S.E. The Mandan Police Department declined a request from The Bismarck Tribune for the audio or transcript of the 911 call, citing the ongoing investigation as the reason for not releasing the information. A combined memorial service will be held Tuesday at Bismarck Community Church for the four victims. Funeral director Bob Eastgate has said the families wanted to have a combined service because the co-workers were close friends. Donations for family members of those slain are being accepted at Midway Lanes in Mandan through 9 p.m. Friday. Ziegler said he’ll confer with his staff on closing down a tip line related to the case. He said the case will involve a long process of prosecution. “This is far from over,” Ziegler said. A pastor delivered a message of hope on Tuesday to friends and family of the four people killed last week at a Mandan business.